Northeastern has a good baseball team. As of press time, the Huskies are 33-17 overall, are ranked 34th in the Division I RPI standings, and have already won the Colonial Athletic Association standings with a 17-6 conference record. In fact, Northeastern’s 2018 season was also one of its best in program history—only in 1997 and 1991 did the Huskies win 33 or more games in a season. In the matchup between the Harvard baseball team and Northeastern on April 11, two important factors were at play. 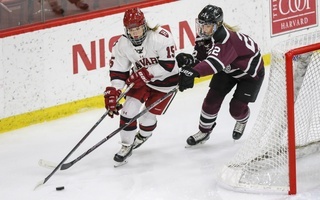 First, Northeastern outranked the Crimson on the RPI rankings by a mile—the Huskies ranked 14th on the April 10 RPI list, while Harvard ranked 157th. 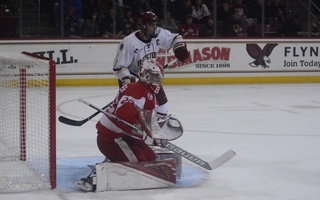 Second, the winner of the matchup would take home the 2018 Beanpot Championship title. The Crimson wasn’t expected to win. In fact, it wasn’t even expected to beat Boston College in the semifinal a week prior. On a humid, cold Wednesday night, losing to the Huskies and taking home a runner-up finish would’ve been respectable. But talk to the Harvard players, and they’ll tell you that they weren’t the underdogs. Sophomore Hunter Bigge and senior Austin Black celebrate at the plate against Penn on April 7. The two have been important bats for the Crimson in the middle of the lineup this season. The Bad Boys of Boston had that kind of confidence about them all year. The Crimson had been playing increasingly well in April and late March and, by the time mid-April rolled around, figured it could skyrocket through the sub-.500 precedent past Harvard teams had set. The Crimson was 12-14 and only looking up. On the other hand, Northeastern’s squad had several accolades itself—at the time, the Huskies carried a five-game win streak, had won seven of eight, and had only lost once in conference play. By all accounts, after getting swept by No. 10 Texas Tech, Northeastern was rolling. Both teams were also coming off big late-inning home runs in their respective Beanpot semifinal matchups; Northeastern on an eighth-inning grand slam to beat UMass, and Harvard on an 11th-inning three-run dinger to take down B.C. The championship game had already been delayed once; inclement weather pushed back the Tuesday midweek tilt to a Wednesday afternoon first pitch. 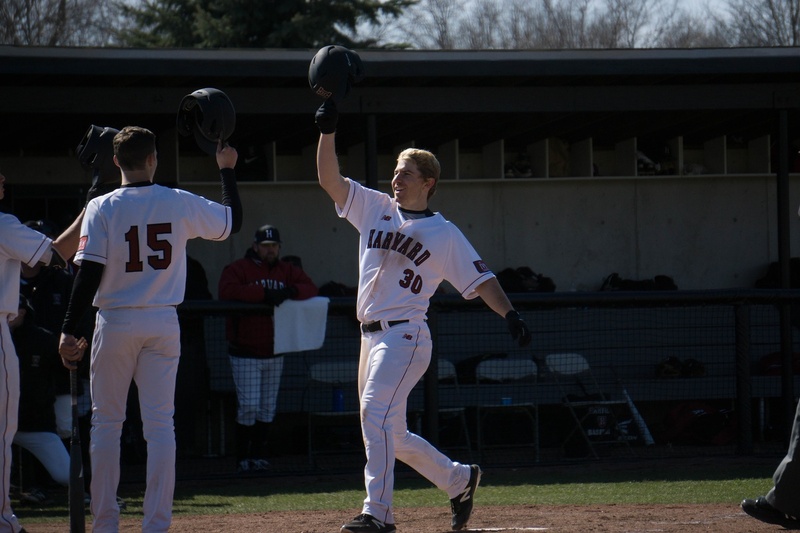 A combination of confidence and a loose playstyle meshed to produce an 8-6 comeback Harvard upset victory over Northeastern at Friedman Diamond in Brookline, Mass. 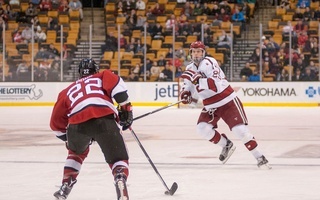 This result delivered the Crimson its fourth sole Beanpot championship title and a cornerstone win in one of Harvard’s best seasons in years. Out of the gates, it didn’t look like the Crimson could pull it off. Fewer than two outs into the game, the Huskies had already scored six times off of junior righty Kevin Stone, sending nine batters to the plate and hitting a grand slam to cap it off. By the time Harvard jogged back to the dugout, it was already 6-0 Northeastern. Facing a blowout against a strong team, and with little to lose, the Crimson responded. Third baseman and pitcher Hunter Bigge led off the top of the second with a single. Senior second baseman Matt Rothenberg hustled to get on base after the Northeastern third baseman mishandled a ground ball. Then, with two outs, junior catcher Devan Peterson mashed an RBI double to right-center to produce two sorely-needed runs in response to the Huskies’ six-spot a frame prior. Suddenly, the score was 6-2, and thoughts of an easy blowout were gone. 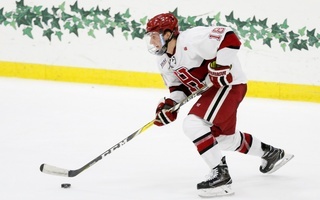 Could Harvard produce yet another comeback, something it had done all year long? After a rough first, Stone settled down and recorded a relatively uneventful, clean bottom of the second. The scoreless inning kept Harvard’s momentum alive—it was now clear that the Huskies weren’t going to run away with it very easily. "As soon as we started to get a little offensive production going, momentum swung back in our direction. Once the ball got rolling, we all got the feeling of, 'Here we go again, here come the Bad Boys of Boston making the comeback…'" junior outfielder Ben Skinner said. The confidence is one thing. The second factor that pushed the comeback over the edge was the Crimson’s ability to play its best when it plays “loose”—fun, relaxed, and without any pressure on. With a good dugout vibe going, Harvard made erasing a 6-2 deficit look easy. Wellesley, Mass., native and freshman right fielder Tommy Seidl set the stage in the top of the third with a leadoff walk. McColl, perhaps the team’s offensive MVP this year, followed with a base knock to move Seidl to third. Junior outfielder P.J. Robinson kept the rally going with an RBI hit to second base and make the score 6-3. Three batters later, with the bases juiced, Rothenberg knocked in McColl with a single to right, closing the gap to just two runs. Freshman shortstop and Duxbury, Mass., native Buddy Mrowka then delivered the loudest hit. The rookie made the Huskies pitching staff pay with a bases-clearing triple to the deepest part of the diamond, giving Harvard a decisive 7-6 lead. Peterson’s sac fly a batter later topped it off. Stone went on to pitch five innings, putting up four goose eggs in a row, and junior John MacLean and sophomore Kieran Shaw combined to shut out the Huskies for the rest of the game. After Shaw got a swinging strikeout to end the game, the Crimson lifted an unexpected Beanpot trophy and began celebrating. The locals knew what it mean to bring home the silver trophy. The big win over a strong team made the win all the more special.